Despite doing my best to ignore the never ending winter we’ve been having, I still can’t help but feel that summer is really far away! I suppose that’s what happens when it’s May and there’s still snow in the forecast. So while I continue ignoring our terrible weather, I bring to you Part 4 of my Organic Gardening Series: How to Thin Seedlings. 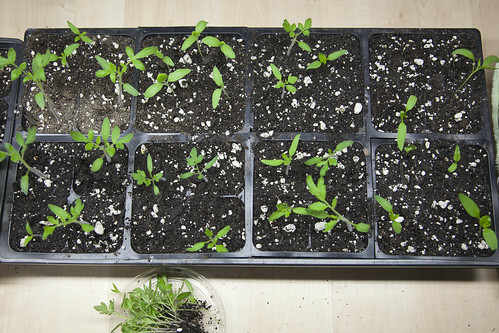 Below you can see a photo of my little tomato seedlings, which are doing quite well. I have cabbage and onion seedlings that should technically be outside already, but I’m waiting another week or so for that. 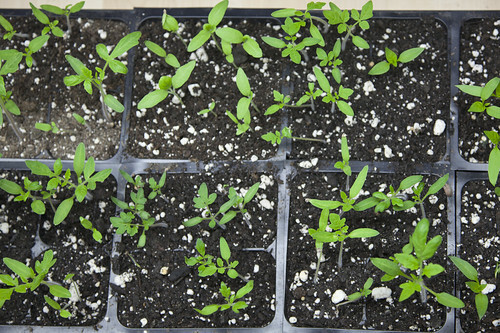 When you live in a cold climate where the growing season is short, it’s very likely that you’ll be starting seeds indoors up to 10 weeks before planting them outside. That’s a long time, and your little plants will need a lot of room to grow before being transplanted. If seedlings are not thinned down to 1 plant per potting cell, there won’t be enough room for all of the roots to grow and none of the plants will thrive. As much as it pains me to snip the little guys down, I’ve come to realize that it’s something that needs to be done. It’s so hard when seeing the first little sprouts come up give you such joy, and then you have to go through and take a bunch of them out. I’ve gotten better about thinning my seedlings over the years, and my plants have been stronger for it. My recommendation for those of you that have a hard time with this is to take your little seedlings and put them right into the compost bin. This way their sacrifice isn’t going to waste! I generally start 3-4 seeds per pot, and thin down to the strongest one as soon as the leaves start touching each other. At this point, they’re usually between 2 and 3 inches tall. The easiest and least invasive way to thin your seedlings is to use a pair of scissors and snip them off at the base. 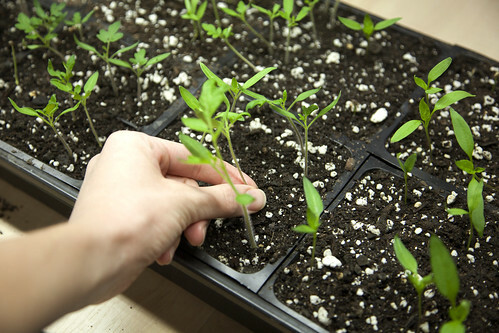 If you’re careful and your seedlings are still small, you may be able to gently pull them out of the soil without disturbing the roots of the other seedlings. Voila! Once thinned out, you’ll be surprised at how quickly the remaining seedlings seem to grow! Next time, I’ll be talking about transitioning your seedlings to the outdoors, and getting your garden planting started. Hopefully after our record-breaking snow amounts in April, May will quickly turn around and warm things up for us. Here’s hoping!